The Fury Mk II is a Rank I British fighter with a battle rating of 1.0 (AB/RB/SB). It has been in the game since the start of the Open Beta Test prior to Update 1.29. 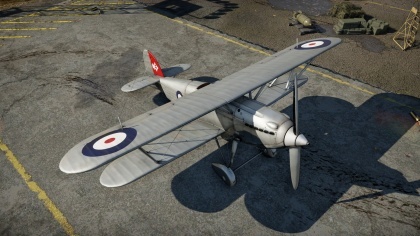 The Hawker Fury Mk II is a slightly improved version of the Mk I, this time featuring WEP. Both of them are reserve planes for the British tree. They also have the same armament, 2 x 0.303 in (7.7 mm) Vickers Mk IV Machine Guns. Unlike the other Hawker reserve planes, both Furies are land based fighters. 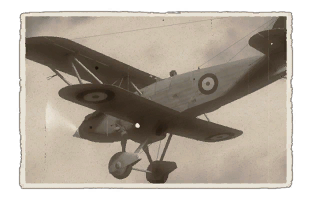 With 2 x 7.7 mm Vickers machine guns the Fury Mk I can take down any I rank plane so long as the shots are aimed well. Ki-10 The Ki-10 is can easily out turn the Fury Mk.II in a turning engagement. The best tactic to use against the Ki-10 is to dive on them and use boom and zoom tactics. Also remember due to the weak engine of the Fury Mk. II it is not easy to climb or maintain its energy. I-15 The I-15 is another opponent that the Fury Mk.II will lose to in a turning engagement. When battling the I-15, the tactics of an aerial engagement against the Ki-10 maintains the same. Do not try to head on a I-15 at all costs as well, as its 4 machine guns will easily out match the two machine guns carried by the Fury Mk. II. Once the "Offensive 7.7 mm" modification is unlocked, it is recommended to take the "Stealth Belts" as the increased number of AP rounds will raise the chances of a critical hit on your enemy. The Hawker Fury (Mk I) entered service in 1931 and was the first RAF fighter to exceed 200 m.p.h. in level flight. The Mark II was even faster and both types of Furies remained in service with various air forces right up to the start of WWII. A special version fitted with a Bristol radial engine was built for Iran/Persia, but most 'normal' Furies had a Rolls-Royce Kestrel of 525 hp or 640 hp. Many other versions of the Hawker Fury were made, including the Yugoslav, Persian, Norwegian, Portuguese and Spanish Furies. The Fury was armed with 2 x 7.7 mm machine guns. This page was last edited on 29 January 2019, at 12:10.